This is the first English edition of a book originally written in Spanish, published in the 1980’s and distributed widely in Mexico and throughout Latin America. Shelter Publications made this new edition available in 2008 because of the relevance of the content to our current times. 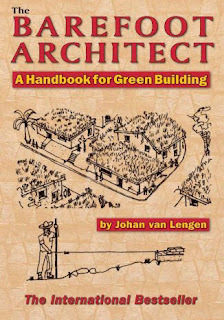 A massive paperback of about 700 pages, The Barefoot Architect could almost be considered a complete compendium of indigenous building techniques from Latin America. Van Lengen’s approach to explaining the concepts presented is extremely graphic, so the book is full of thousands of hand-drawn images, and these images really help convey the subtleties of designs and ideas. At the outset the reader is given the basics of how to design a house, along with the fundamentals of drawing plans. The constant objective is to provide the tools for people to come up with their own plans based on the guidelines outlined in the book. In designing a house, the local climate will determine many aspect of what is appropriate. To help emphasize this van Lengen divides climate zones into “humid tropical,” “dry tropical” and “temperate” zones. Most of the strategies presented for “temperate” zones are applicable to building in North America and Europe, although these regions could benefit from a greater emphasis on insulation. Guidelines are given for choosing a site based on environmental considerations in order to provide sufficient ventilation, light, heat, drainage, etc. The recommendations go beyond single residential development, with public or commercial buildings and whole communities embraced; this is also a book about urban or village planning to some extent. Each climate zone is examined in detail according to what house shapes and design elements are appropriate. In the humid tropics you want high-pitched roofs that readily shed rain, don’t heat up so much in the sun, and allow space under them for interior heat to rise. Substantial eaves will keep moisture off the walls. Good ventilation is essential. Specific building instructions are given for working with common materials found in the tropics, such as bamboo and palm leaves. In the dry tropics comfort depends on good air circulation and providing plenty of shaded areas, such as with open courtyards. Details for constructing wind catchers and natural evaporative cooling concepts are shown. Earth berming is encouraged to help moderate temperatures. Vaults and domes work well in arid climates, and the construction of these is detailed. In temperate climates that require heating it is best to pay attention to how the sun can be harnessed to do this, and many aspects of passive solar design are presented. Simple fireplace and wood stove designs are detailed. Ways to keep cold winds from sapping heat from the house are explained. Tempering inlet air by passing it through the ground is another strategy discussed. Following the climate specific sections, the book dives into exploring a variety of building materials, mostly of natural origin. These include earth, sand, lime, wood, cactus, bamboo, sisal, ferrocement and seacrete. Guidelines for how to choose appropriate materials, with an emphasis on sustainability, are provided. Van Lengen details some uncommon techniques that could be quite useful for a variety of projects, such as making “concrete shell panels” for supporting roofs. The largest section of the book (186 pages) is devoted to the construction of all of the different parts of a house, starting with foundations and proceeding through walls, floors, roofs, doors, windows, and utilities. I recognize many of the methods as being quite common in Mexico from the time that I lived there. Stone, adobe, wattle and daub, plant fiber, bricks, home-made concrete lintels, thatching, green roofs and joinery techniques are just a few of the topics covered. You can learn how to make stairs, leveling tools, sinks, silos, wheelbarrows, lathes and ladders in this book. The chapter on energy covers windmills, waterwheels, solar water heaters, solar dryers, an ice maker, masonry stoves and solar cookers. The amazing thing is that enough description is given for a person to make all of these items from common, easy to find materials. There is a substantial chapter on water that describes ways to develop water from a spring or creek, how to make several styles of pumps, how to make pipes from bamboo, how to make cisterns and how to dig a well. Various methods of filtering, purifying and distilling water are also shown, along with how to make a simple evaporative cooler. The final chapter is about sanitation and covers outhouses, composting toilets and drainage around a house. It is amazing that one book can explain so much in enough detail for a person to actually take advantage of what is presented. Anyone interested in developing a basic, down-to-earth homestead could save hundreds or thousands of dollars by follow the advice given in this book. But not just money is being saved, it is our world through ecological, sustainable solutions like those presented here that will make life possible in the future.